The old Grand Theater was built in the 1930’s as a movie show house and lay vacant for 5 years before a group of residents bought it and remodeled it, creating a stage for live productions and naming it the Worm Creek Opera House in Preston, Idaho. Worm Creek Opera House in Preston, Idaho is one of the gems of the small town. Retail stores and businesses along State Street are being picked off like apples on a tree. Hardware stores, grocery stores and other retail storefronts have disappeared, but the movie house remodeled as a community theater has become a source of pride to the city. Paul Swainston was there from the beginning of the restoration. 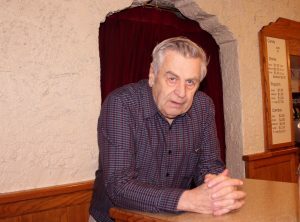 He is a longtime advocate, board member and caretaker of the building, and has developed a deep affection for the Worm Creek Opera House in Preston, Idaho. The Grand Theater was built in the 1930’s as a movie show house. It closed in 1980 and lay vacant for five years before a group of residents bought it and remodeled it, creating a stage for live productions. The red brick structure was named Worm Creek Opera House as tribute to the town’s history. Before the town was named “Preston” in honor of William B. Preston, president of the Church of Jesus Christ of Latter-day Saints’ Cache Stake, it was called Worm Creek, after a winding creek that runs just south of the city. Paul Swainston, a cabinet maker by trade, was there from the beginning of the restoration. 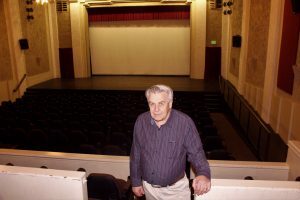 He is a longtime advocate, board member and caretaker of the building, and has developed a deep affection for the Opera House. He said the old building is a blessing to the community. Theater is a place for people to grow and spread their wings. 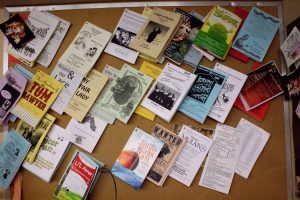 Programs from past productions hang on a board behind the stage at the Worm Creek Opera House in Preston, Idaho. “I’ve seen the difference it makes in people lives,” the father of six said. “They come in here and can’t string 10 words together to make a sentence. “Then the magic happens. When you get them on the stage it changes their life. He admitted he was one of those people. He sang on stage with a choir his senior year of high school and got hooked. The Opera House shows movies Friday, Saturday and Monday, but whenever there’s a live production, it takes precedent. The production was sold out every night. Most of the actors live in the county, but they have a few people outside the county try out for parts occasionally, and they have the same chance as anyone else. 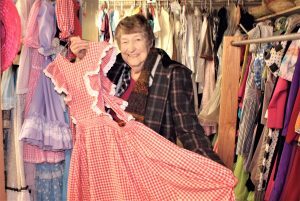 Glenda Swainston has sewn, collected or invented over 7,000 costumes with the help of volunteers over the years for the Worm Creek Opera House in Preston, Idaho. There is a lot of talent in Franklin County, he said, and they are all volunteers, no one gets paid. Glenda, Paul’s wife of 58 years, has also been involved from the beginning. She is the costume queen of the theater. She has sewn, collected or invented over seven thousand costumes over the years. Of course she’s had some help. It started with her putting out a call for old clothes. But eventually the 7000 piece wardrobe was created. Income from the movies helps pay for the live productions, and over the years they have made several upgrades on the theater. They added new seats, sound system, a digital projector, ADA restrooms, new electrical service and wiring upgrades. Paul Swainston a board member of Franklin County Theater Arts Council is proud of the work they have done at the Worm Creek Opera House in Preston, Idaho. The theater seats 219 people. Part time resident and national radio personality Glen Beck has conducted a few fundraisers at the theater, for the theater, and helped the theater get a grant so they were able to get the upgrades. The schedule for the year is already set, with a variety show using music from past productions on “Night to Remember,” January 30-31. Find all the details on their website, wormcreek.org.